In order to avoid sounding like a broken record I'll let you know right here that you need to be quite precise here. It'll really show in the results. On with the tutorial - Allons-y! These are the tools used. With one exception - the glue marker. How I could forget such a useful object is beyond me. The first step is to make the card blank. 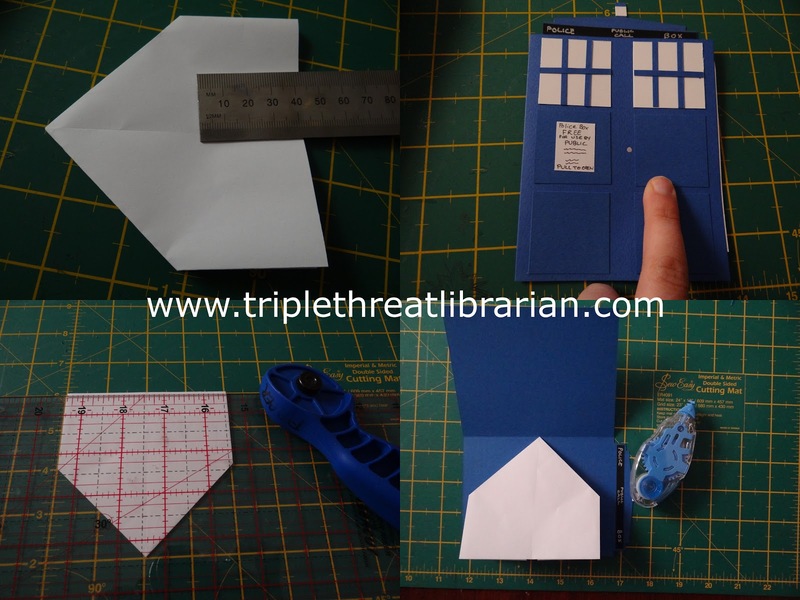 Start by cutting an 8"x6" piece of TARDIS blue card. Keep the scraps, you'll need them later. The best way to make the larger cuts is with a quilting ruler and rotary cutter. The cuts are kept straight and it's very easy to line things up precisely (don't use a craft knife with a quilting ruler, you'll kill the ruler). Using the bone folder, score a line at the 4" mark on the long side. If the paper is textured, score on the side that will be the inside. Fold along the line and, with the card folded, run the flat of the folder along the crease to sharpen it. Cut the top inch from the side that will become the front cover, and prepare for one of the trickier sections. Keeping in mind you will need to erase later, rule a pencil line one inch from the top in line with the previous cut(not shown in the picture). Measuring up from here rule a line at 3/8", 1/8" and 1/8". This should leave 3/8" at the top. As per the lower left section of the picture above, n the lowest ruled section draw vertical lines 1/4" from each side. In the next section draw lines 1/2" from each side. In the top section draw lines around a 1/4" section at the centre. Join this to the tier below with a diagonal line. 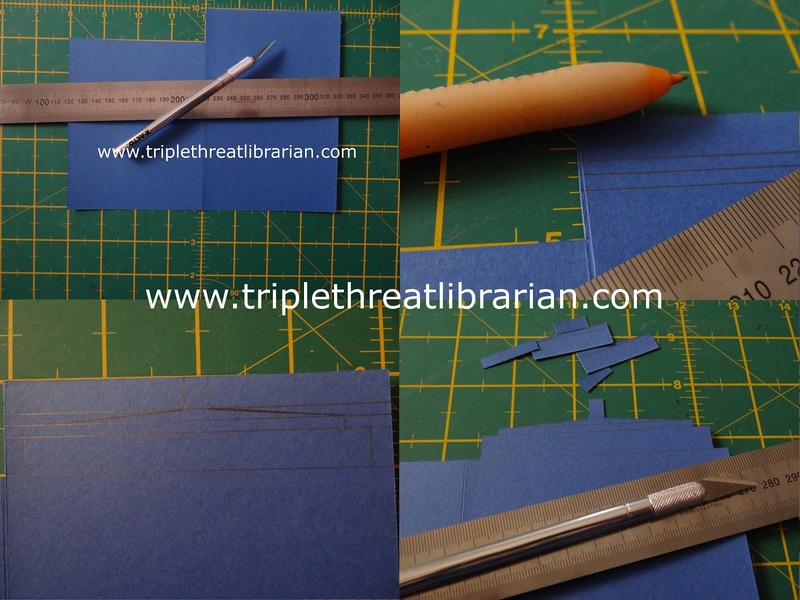 Cut around this outline using a metal ruler and craft knife. You may find it easiest to cut small sections away. Erase the remaining pencil lines. 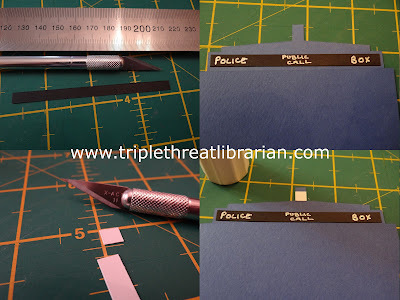 Cut a section of black cardboard 1/4"x3.5", or slightly shorter if you prefer (see right side pictures). Write on the card with a silver paint or gel pen as shown. Stick in place with glue stick or marker. Cut a 1/4" square of white card. Stick to form the light at the top of the card. That's the top section complete! Next, on to the front. Cut four 1.5" squares, four in blue, two in white. Cut a blue strip 1/8" wide and at least 4.5" long. Don't worry if it curves a bit, that's fairly unavoidable. Cut it into three 1.5" sections. Using a glue marker, stick the strips on to form a window pattern. 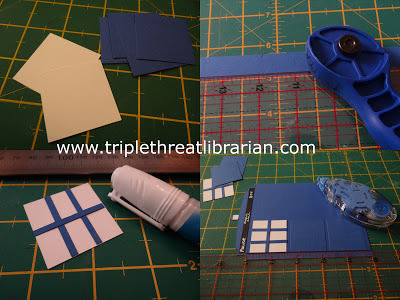 On the front flap of the card, stick the blue and white squares. They should be 1/4" from the edge of the card and 1/8" from the top, bottom and other squares. You can use any kind of paper glue here, but glue tape doesn't have a drying time so you can continue on without fear of shifting things. Repeat for the other side. Cut a piece of white card or printer paper 1"x3/4" and write on it with a fineliner as shown. Glue it to the centre left panel. While you're at it, why not add a silver doorknob? Congratulations! The front is complete. The rest should, by comparison, be very easy. The pop-up that will form the inside is a map fold. There's a great tutorial for it on this website (link replaced Feb 2015) which I doubt I can improve on. Use an 8"x8" square. The tutorial uses a rectangle, but squares are fine. If you put it in your card you'll likely find it's marginally large. No worries! Cut off 1/8" and get the added bonus of an extremely tidy visible end. Ta-da! It's bigger on the inside! With Adelaide's famous Christmas Pageant on tomorrow and as I'm also preparing a lot of work for a stall I'll have at St John's Anglican Church Christmas Fair (Friday 16th November, 6p.m., Church Gardens at 379 Halifax Street, Adelaide) I'm in a very Christmassy frame of mind. I twisted together sparkly pipe cleaners and made a wreath to make a Christmas TARDIS. That concludes my first tutorial! I hope you liked it - I expect I'll make more in future. If you use this tutorial, either as-is or with modifications, I'd love to see what you do! Please do not use this to produce items for sale. Do, however, feel free to share the tutorial further. By all means use the first or last image as a link, but please link to this blog for the rest of the tutorial. I'll go first: this is really clever! Thanks! Thank you for this tutorial. I have been thinking about how I would make a Tardis card for a few friends, but had not come up with the final idea. Your tutorial is perfect! You even nailed the "Its Bigger on the Inside" concept. Love it. This is really awesome! I have a friend that is a die hard Whovian! Going to have to make this for her!!! Thanks for the tut! This was so much fun! I worked on it all day at work when I had a few minutes here and there, and I made several new friends as people passed my desk and saw the signature blue box :) So cool! Thanks for this tutorial! I just made my first one and it turned out perfectly! I plan to make another few for some friends cause after making the first so well I am not sure I can actually bring myself to give it away. My best friend is SUPER into Doctor Who, and is the reason I love it so much...I'm going to try and make this as her birthday card ^_^ great tutorial! Thanks! This is very neat. We love Doctor Who in our house, and my oldest son has already requested a Doctor Who themed birthday party for his next birthday. These will make the perfect invite! This is really amazing cleaver!and looking fantastic.Thanks for the sharing post. Im going to make this to give to them for Whomas, with Drs (CE, DT & MS) and companions such as rose, martha, donna, amy, rory, river and clara. I just made this for my "little" brother's 18th birthday and it turned out so well! I will say that it was easier for me to go to YouTube and find a tutorial for a "Turkish map fold", and watch someone actually fold the inside, rather than reading the instructions. But I think that's just the way I learn best! Thanks for the great card! I can't wait to see my brother's face when he opens it! I hope he loves it! I'm thrilled every time I hear of someone who has used this tutorial! You rock. 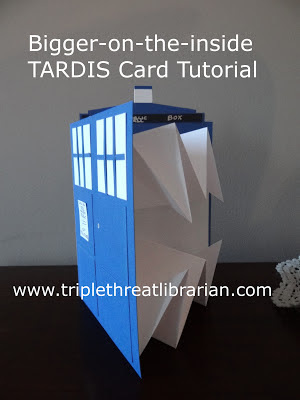 While I do make cards often I have 0 experience with Doctor Who and needed some help getting a card for an eleven year old girl with a big Doctor Who obsession off the ground. Thanks to your tutorial the card is done and en route now. 10,000 good karma points to you my friend! Thank you sooo much! My boyfriend and I ADORE Doctor Who! Since his birthday is Valentine's Day, (which also happens to be our 6 month XD) I am making this for him! Also figured I could write "I love you" in gallifreyan as a little quirk! I don't know what I would have done without this, THANK YOU. Loved this tutorial! Making my boyfriend a birthday card as well, and it turned out wonderfully! Thanks so much for this tutorial! Whee! Sadly, very few people in my life are fellow Whovians. Fortunately, they are just the type of people that would totally enjoy and appreciate the effort I'd put into making this for them! Thank you so much for sharing such a clever tutorial! link for inside part doesn't go to a tutorial!! HOW DO I DO IT!!!??? Our home * last night * Sorry I should have previewed. Don't you just love auto correct? HA ! Heh, grew up in Adelaide, six months in Scotland, now living in Melbourne. These are the worst directions. Tried it out and it work on the first try - the directions were a bit hard to follow here in there, but all in all a fun tutorial and project to bring to life :) I am sure that the Whovien I made it for will massively enjoy it - cheers, A. Thank you. This is fun.